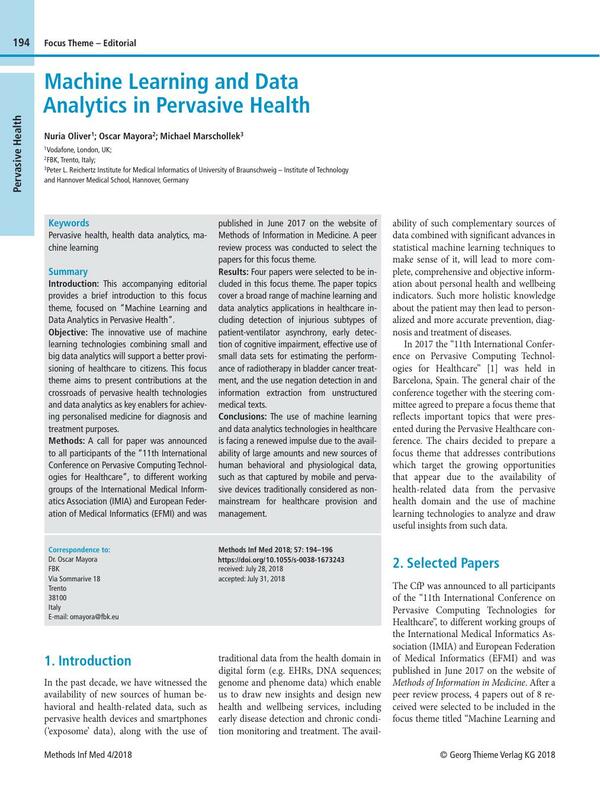 Introduction: This accompanying editorial provides a brief introduction to this focus theme, focused on “Machine Learning and Data Analytics in Pervasive Health”. Objective: The innovative use of machine learning technologies combining small and big data analytics will support a better provisioning of healthcare to citizens. This focus theme aims to present contributions at the crossroads of pervasive health technologies and data analytics as key enablers for achieving personalised medicine for diagnosis and treatment purposes. Methods: A call for paper was announced to all participants of the “11th International Conference on Pervasive Computing Technologies for Healthcare”, to different working groups of the International Medical Informatics Association (IMIA) and European Federation of Medical Informatics (EFMI) and was published in June 2017 on the website of Methods of Information in Medicine. A peer review process was conducted to select the papers for this focus theme. Results: Four papers were selected to be included in this focus theme. The paper topics cover a broad range of machine learning and data analytics applications in healthcare including detection of injurious subtypes of patient-ventilator asynchrony, early detection of cognitive impairment, effective use of small data sets for estimating the performance of radiotherapy in bladder cancer treatment, and the use negation detection in and information extraction from unstructured medical texts. Conclusions: The use of machine learning and data analytics technologies in healthcare is facing a renewed impulse due to the availability of large amounts and new sources of human behavioral and physiological data, such as that captured by mobile and pervasive devices traditionally considered as nonmainstream for healthcare provision and management. 2 Valladares Rodriguez S, Pérez-Rodríguez R, Fernandez-Iglesias JM, Anido-Rifón L, Facal D, Rivas-Costa C. Learning to detect Cognitive Impairment through Digital Games and Machine Learning Techniques: A Preliminary Study. Methods Inf Med 2018; 57 (04) 197-207. 3 Dietrich G, Krebs J, Fette G, Ertl M, Kaspar M, Störk S, Puppe F. Ad Hoc Information Extraction for Clinical Data Warehouses. Methods Inf Med 2018; 57 Open 1 e22-e29. 4 Rehm G, Han Jinyoung, Kuhn B, Delplanque JP, Anderson N, Adams J, Chuah CN. Creation of a Robust Machine Learning Classifier for Patient Ventilator Asynchrony. Methods Inf Med 2018; 57 (04) 208-219. 5 Tsai TI, Zhang YF, Zhang ZG, Chao GY, Tsai CC. Considering Relationship of Proteins for Radiotherapy Prognosis of Bladder Cancer Cells in Small Data Set. Methods Inf Med 2018; 57 (04) 220-229.